PepsiCo wants to rethink how and what consumers drink–and it has invented an entirely new system to give people a healthier alternative to soda. The company’s newest venture is centered on a 20-ounce reusable water bottle that comes with sets of flavor pods. The new product line, called Drinkfinity, is a clear reaction to consumers drinking less soda. Over the past 20 years, sales of non-diet soda have fallen by more than 25%. As a result, PepsiCo and its competitors have turned their attention to bottle water and other types of drinks–though the company’s executives prefer to frame the shift in their priorities as giving customers more choices rather than combating the decline of soda. That’s where Drinkfinity comes in, as another healthy option in the company’s portfolio. The name is meant to indicate that there are infinite combinations of drinks you could make with the bottle and the flavor pods. The Drinkfinity team’s ultimate aspiration is that consumers go online, choose all the ingredients they want, and have personalized pods shipped to their door–a vision that reacts to several consumer trends, including on-demand services and healthy living. 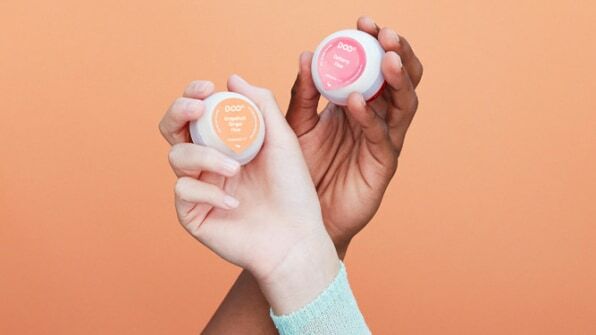 For now, the brand, which launches today, is debuting 12 different types of pods, which have names like Mango Chia Flow and Pineapple Coconut Water Renew. To make yourself a White Peach Chill or a Mandarin Orange Charge, you fill up your Drinkfinity water bottle, unpeel a pod’s label, remove your bottle’s cap, and push the cap of the lid through a pointed plastic structure. This ruptures the dry storage area in the pod and releases the concentrated liquid, which pours into the container. Then you shake and drink. The bottle itself has a magnetic spot on its side to hold down the cap so it doesn’t hit you in the face as you guzzle. And you don’t have to use the pods constantly; you can also just use the bottle for, well, water. Each pod features combinations of wet ingredients, mostly different fruit juices, and dry ingredients, like pieces of ginger, vitamins, lemongrass extracts, and even oats. The company says all the ingredients are natural and there are no artificial sweeteners. The pods, which contain two ounces of liquid, range from 30 to 80 calories each. With the variety of flavors and emphasis on trendy superfoods, Drinkfinity is primed to tap into the billion-dollar health and wellness market, and could potentially appeal to soda drinkers trying to kick the habit. The system’s sustainability is one of the driving forces behind the design. To create Drinkfinity, PepsiCo had to rethink the supply chain, manufacturing, shipping, and even recycling. That resulted in the full life cycle of a single pod producing 40% fewer carbon emissions than the typical 20-ounce drink housed in a plastic bottle you’d buy at the supermarket. The pods also use 65% less plastic than these 20-ounce bottles. Whether or not PepsiCo succeeds in drawing customers, Drinkfinity offers an inside look at how a major beverage company rethinks its design and production systems to meet shifting consumer tastes. Vice president of global business innovation Hernan Marina first conceived of Drinkfinity in 2009, when the company was looking for a way to answer changing customer priorities around sustainability, health and wellness, customization, and choice. But instead of relying on the typical modes of development within a multinational corporation, which involve extension market research, focus groups, and a single product that’s honed to perfection before it’s launched internationally with a large marketing effort, PepsiCo decided to try something different.